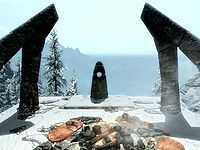 The Lord Stone is one of the thirteen Standing Stones scattered across Skyrim. Activating The Lord Stone will add 50 points to your armor rating and 25% magic resistance. This makes it desirable for endgame characters playing on Master difficulty, as it lowers the difficult-to-reach armor rating and magic resistance caps. 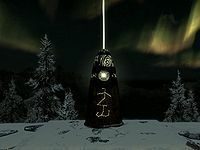 Defensively, it is inferior to the Atronach Stone, but does not carry any sort of penalty with it. The Lord Stone is located on top of a stone base with the remains of a large arch on either side of it. It can be reached by following the path that leads past the Shrine of Mehrunes Dagon. The path starts to the west of the Hall of the Vigilant. There are several piles of rocks marking the route; some have the remnants of banners hanging from them and flapping in the wind. You'll pass Dimhollow CryptDG along the path; once you reach a long flight of stone steps cut into the mountain leading up to the Shrine of Mehrunes Dagon, turn to face northeast. You'll see the Lord Stone a short distance up a hill. The Lord Stone is home to a group of three bandits, at least one of whom is an archer. There are three unowned bed rolls arranged around a small campfire in front of the standing stone. There is also a corundum ore vein at the southwest corner of the base of the structure upon which the stone is set. The path near the shrine is home to a leveled animal, typically a frost troll.